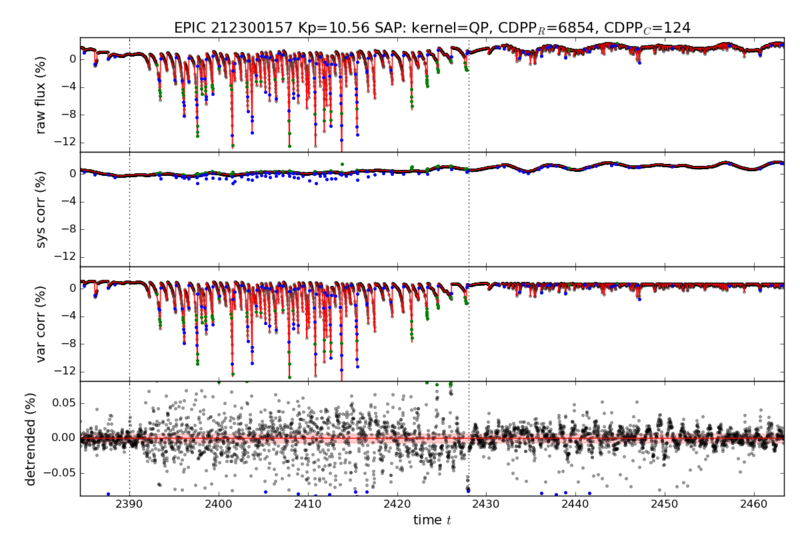 K2SC Systematics Correction - Aigrain et al. August 2017: Version 2.0 of the K2SC files are released. This release contains Campaigns 3-8 and Campaign 10, and also fixes the "cadence" and "quality" columns that were stored as 16-bit integers instead of 32-bit. Simple Aperture Photometry (SAP), detrended. Pre-Search Data Conditioning (PDC), detrended. 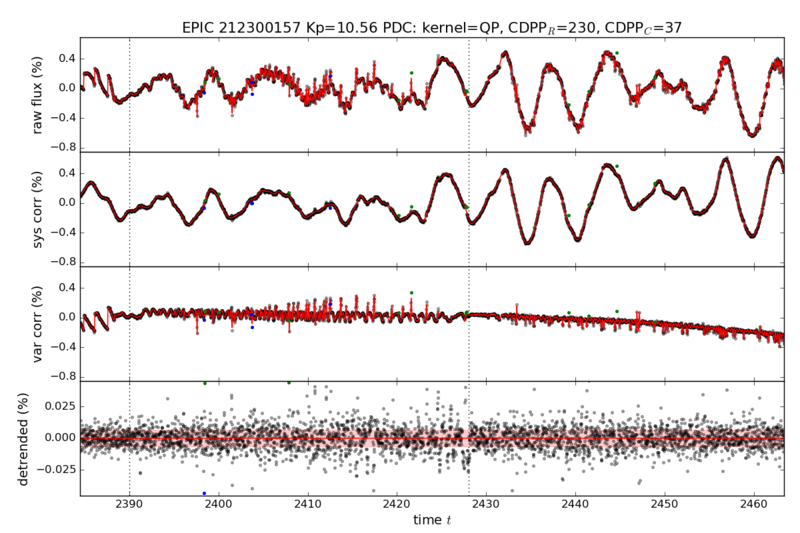 K2SC (K2 Systematics Correction) is a K2 light curve (LC) detrending tool that uses Gaussian processes (GPs) to robustly model the systematics due to the Kepler telescope pointing jitter together with the astrophysical variability. The K2SC-detrended light curves are especially suited for studying variable stars in K2 photometry (by allowing us to remove the position-dependent systematics while keeping time-dependent variability intact), and searches for transiting planets (by allowing us to remove both the systematics and astrophysical variability). The detrended light curves available here use either SAP or PDC-MAP photometry as a starting point (stored in separate binary table extensions in the same fits file), and consist of three components: position-dependent trend, time-dependent trend, and residual (detrended) flux. _lc.fits = FITS file containing extracted lightcurves for both the SAP and PDC-MAP versions of the Kepler lightcurves, one in each extension. The detrended PDC-MAP lightcurve is in the first extension, the detrended SAP lightcurve is in the second extension. _lc-pdc.png = A plot of the detrended PDC-MAP lightcurve. _lc-sap.png = A plot of the detrended SAP lightcurve. 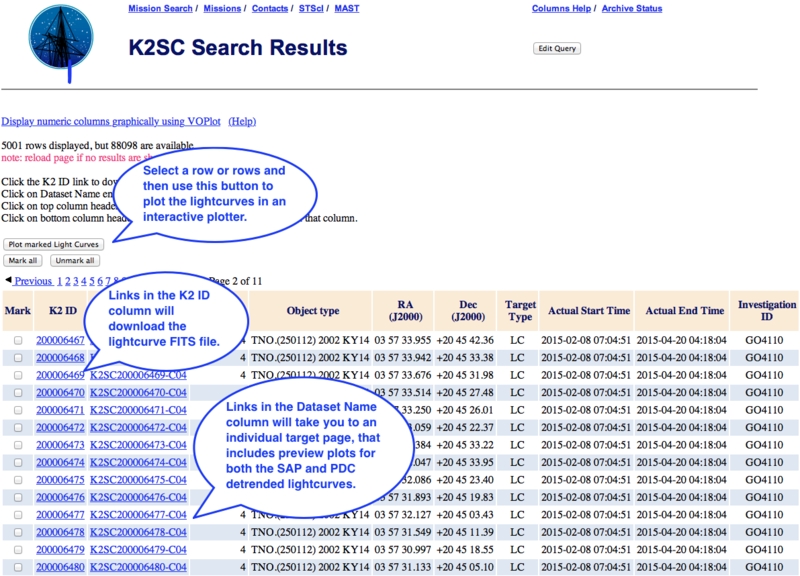 We strongly recommend using the MAST Discovery Portal as the primary search interface for the K2SC lightcurves. 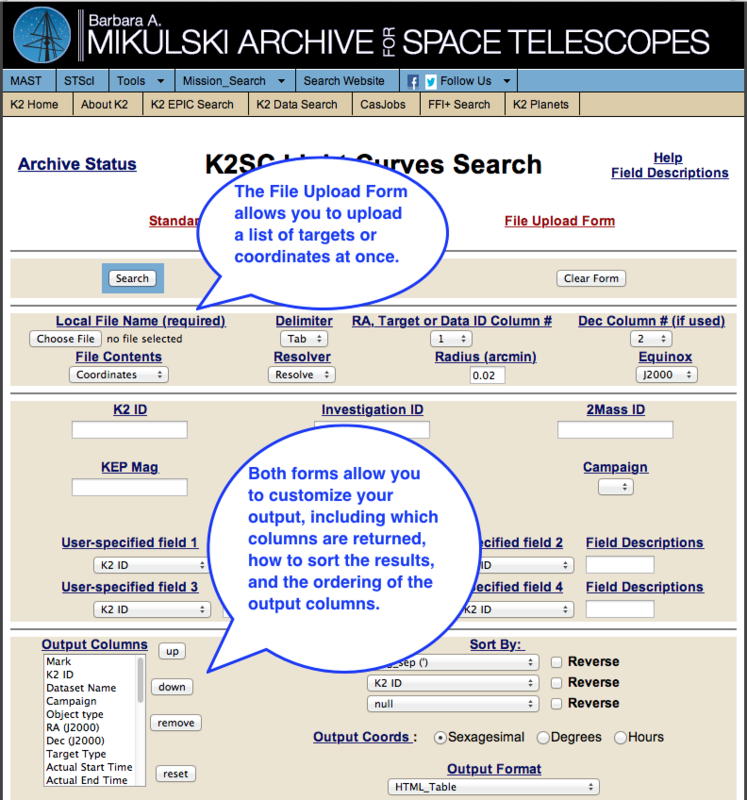 The Portal allows you to search for, and access, all data at MAST (including the K2 mission data like target pixel files). It also features a variety of tools, such as an interactive plotter, a sky viewer with footprint overlays, and cross-match functionality. You can download extracted lightcurves in bulk using cURL scripts. In the table below we provide cURL scripts to download all the extracted lightcurves available for a given campaign. You can also generate custom wget or cURL scripts to download large subsets of the data using the K2SC Search Form (see below). Just change the "Output Format" to be "FILE: WGET LC commands" or "FILE: CURL LC commands", then hit "Search". Instead of displaying your search results in a table, a wget or cURL script file will be downloaded to your machine, which you can then execute with an "sh" command in a terminal to sequentially download each lightcurve in the file. 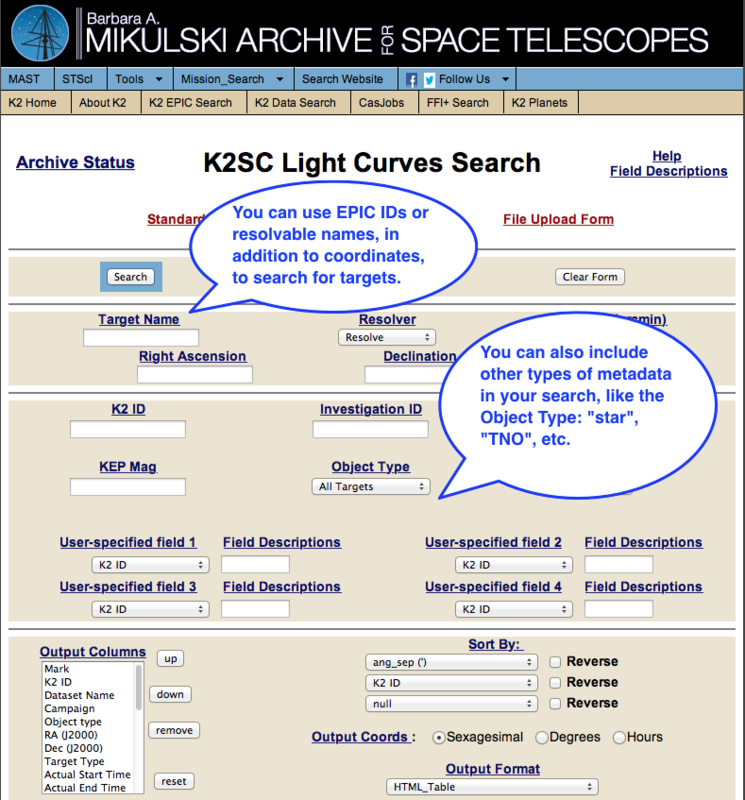 Most users will want to use the K2SC Search Form to search for and retrieve lightcurves for targets. The Search Form allows you to search based on metadata (like magnitudes from the EPIC catalog), coordinates (via cone searches), or target ID (including the EPIC IDs). You can search for a single target or upload a list of targets. The following screenshots demonstrate how to conduct some common search tasks using the Form. Once you have your search results, you may download the FITS file for a target, interactively plot the detrended lightcurves, or visit the individual target webpages that contain preview plots and links to download the lightcurve FITS files. The following screenshot demonstrates how to perform these actions. The interactive plotter allows you to plot one or more target lightcurves with zoom capability. 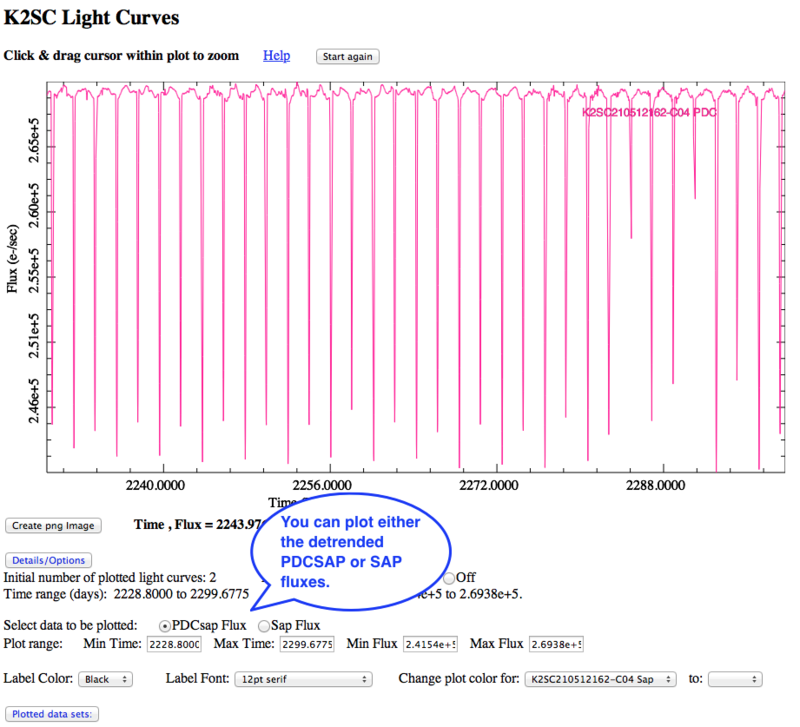 You can also select whether to plot the detrended SAP or PDCSAP lightcurves. The following screenshot demonstrates some of the more common plot functions.